Retrieve a farmer's stolen bow. "Not only did I [sic] they take my bow, but they took all of our coin as well." Talk to Dravin in Merryfair Farm. Find Dravin's Bow in The Ratway. Dravin Llanith is a farmer who works and lives in Merryfair Farm. Talk to him and he will tell you something about his stolen bow, a family heirloom. 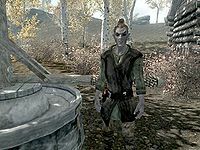 A few days ago, some thieves from Riften broke in his house and stole it. He is quite sure those lowlifes took the bow with them back to The Ratway. If you can head into the Ratway and get his bow back, he would pay you what he can. The Ratway is somewhere under Riften, these sewers and tunnels are inhabited by some skeevers and thugs. Pay attention to the traps at the same time. In order to retrieve the bow, you have to get into The Ratway Vaults. The only way to get to the vaults is through The Ragged Flagon — the door is to the right of the bar. It's not necessary to join the Thieves Guild to get access to the entrance. However, it would be a good choice to do this quest during Taking Care of Business. You can find the bow in a chest in a room near the stairs, guarded by a Vagrant and a Lowlife. Return to Dravin after you get his bow. He will be very excited and reward you with five leveled gems. "I don't know how you got it back, and I don't want to know. Frankly, I don't even care... I'm just so glad to see it again." Several side quests require a certain type of gem(s) so it may be worth making a save point just before talking to him. Loading a previous save will change the gems rewarded thus allowing you to choose, as long as you meet the level requirement for gems. If you find Dravin's Bow before being assigned the quest, you may be unable to return it to him even if he tells you about his stolen bow after you have found it. This issue has been addressed by version 1.2.1 of the Unofficial Skyrim Patch; you may need to save and reload to get the fix to work—using "Continue" from the main menu may not work. If this occurs, you can use the console command setstage FreeformMerryfairFarm 30 to advance the quest to the correct stage, allowing you to complete it. On the PC, it is possible to use the console to advance through the quest by entering setstage FreeformMerryfairFarm stage, where stage is the number of the stage you wish to complete. It is not possible to un-complete (i.e. go back) quest stages, but it is possible to clear all stages of the quest using resetquest FreeformMerryfairFarm.